The Men and Women had today Qualifications and Mixed Team Men/Women Qualification will be competed on Friday. Best athletes will receive the place for Saturdays Olympic Events Finals. So Saturday will be a special day. This system is in action first time. Before the Individual events were competed on the same day. The Quarterfinals of Air Pistol and Rifle Men and Women will compete also on Friday. Semifinals and Medal Matches are on the last competition day Sunday. The best of the Qualification was Ukrainian Pavlo Korostylov. He was an excellent shooter also when he was junior and now he has taken with certain steps the top level place in Men events. His result was 582. Second was Russian Artem Chernousov (581). Pablo Carrera was third and was one point behind Chernousov. Ukraine and received also another athlete to finals when Oleh Omelchuk same result as Carrera (580). Same result did also Vadim Mukhametyanov from Russian Federation. The three last qualified athletes were Giuseppe Giordano (578) from Italy, Damir Mikec (578) from Serbia and Yusuf Dikec (578) from Turkey. The result list of the 10m Air Pistol Men Team Qualification was following: Ukraine (1736), Russian Federation (1733), Italy (1726), Serbia (1723), Slovakia (1721), Germany (1719), Hungary (1716), Latvia (1710), Croatia (1698), Slovenia (1693), Great Britain (1685), Montenegro(1672), Bosnia and Herzegovina (1664). The Quarterfinals will be on tomorrow. There was a sinking feeling in the Indian camp as events offering Tokyo Olympics quota places came to an end at the ISSF World Cup here on Tuesday. India could win only one of the 12 quota places on offer from the tournament. Expectations were high from shooters to fire at home and book Tokyo berths. Now they will have to compete in the remaining two World Cups and continental events to win quotas. On Tuesday, Manu Bhaker and seasoned Heena Sidhu failed to qualify in 10m air pistol, drawing curtains on a disappointing campaign. After the organizers managed to save the tournament’s ‘Olympic qualifying status’ following denial of visas to Pakistan players, there was relief and shooters were expected to come out firing . Rifle shooter Apurvi Chandela, who had already won a Tokyo Games quota from the World Championships, gave a rousing start by winning gold in women’s 10m air rifle. Teen sensation Saurabh Chaudhary carried forward the momentum, claiming gold and a Tokyo Olympics quota place in 10m air pistol with a world record score (245). But the challenge fizzled out thereafter. Only four Indians could make it to the finals in eight events, six of them were offering Olympic berths. On Tuesday, there was huge expectation from ace pistol shooter Heena Sidhu and young Manu Bhaker when the duo lined up for the qualification round in women’s 10m air pistol. Going by the recent performances of Heena and Manu, the Indian camp was hopeful of at least one quota place. But at the end of the 75-minute contest, it turned out to be a damp squib. Heena scored 571, while Manu shot 573 to miss out on a final berth. Manu finished 14th and Heena 25th. Incidentally, both shooters have regularly shot 575 and above. The third Indian in the fray — Anuradha — too faltered. Her best on the day was 571. Iran’s Mina Ghorbani was the eighth and last competitor to enter the final with a total of 574. “Some bad shots hampered my progress. Also, I should have managed my time better,” said Heena. She had a poor start, scoring two 8s and one 9 in the first series of 10-shot. Though Heena had better scores in the second series, she wasn’t able to stay in the zone for long. Heena claimed that “too much training’’ was one of the reasons for the poor show. “I badly wanted to win the quota. It weighed too much on my mind,’’ she said. Women’s 25m sports pistol too was considered a strong event. Jakarta Asian Games champion Rahi Sarnobat and 16-year old Manu were among the contenders. While Rahi failed to recreate her Asian Games form, Manu had a roaring start, finishing second in qualification. She, however, faded away to finish fifth in the final. Pistol coach Pavel Smirnov said the shooters had good scores in the preparatory camp. ‘’We will review the situation. Maybe, they were bogged down by mental pressure,’’ he said. In men’s 25m rapid fire pistol, teenager Anish Bhanwala reached the final, but he too finished fifth in a competitive field that included Germany’s Rio Olympic champion Christian Reitz. There was also disappointment at the 50m range as seasoned rifle shooters like Sanjeev Rajput and Tejaswini Sawant failed to inspire others. The 2019 ISSF Wolrd Cup season kicked off today from New Delhi, India, where the first match of the year - the 10m Air Rifle Women Final - took place at the Dr. Karni Singh Shooting Range. The match turned into a triumph for the home country, as local hero Apurvi Chandela secured gold in a spectacular fashion, while setting a new world record of 252.9 points, out of 24 final shots. That means she scored more than 10.5 points per shot, in average, throughout the final: an exceptional achievement. After a relatively slow start, the 26-year old shooting star of India climbed into the upper part of the leaderboard. The crowd burst into applauses as she scored a sharp 10.8 on her 16th shot, moving up to the second place. A 10.6 on her 17th shot propelled her atop of the table, where she continued shooting excellent tens, to end up in first place. Chandela’s 252.9 final score turned out to be her personal best, as well as a new world record that shattered the previous 252.4 record set by China’s Zhao Ruozhu last year. The Chinese athlete was part of today’s match, and closed in second place with 251.8 points. The 2018 Asian Games Champion led the match throughout the first shot, but couldn’t resist the progression of Chandela, who was supported here by a cheerful crowd of local supporters. The second Chinese finalist, Xu Hong, 20, took today’s Bronze with 230.4 points. With their silver-bronze combo, the two Chinese teammates also secured the two Tokyo 2020 quota places up for grabs, as Chandela had already won an Olympic ticket at last year’s World Championship (each athlete can only win a maximum of one quota). The third Chinese finalist, Zhu Yingjie, the 2017 Junior World Champion, closed the match in 4th place with 206.7 points. The Wolrd Cup stage will continue tomorrow. An action-packed Sunday will see the conduction of three finals: the 50m Rifle 3 Positions Men, the 10m Air Pistol Men and the 25m Pistol Women matches. All finals will be broadcasted live on the ISSF website, YouTube, Facebook and Livestream channels. The International Shooting Sport Federation (ISSF) has revealed several proposals have been put forward to help reduce costs for Tokyo 2020 in holding the sport. 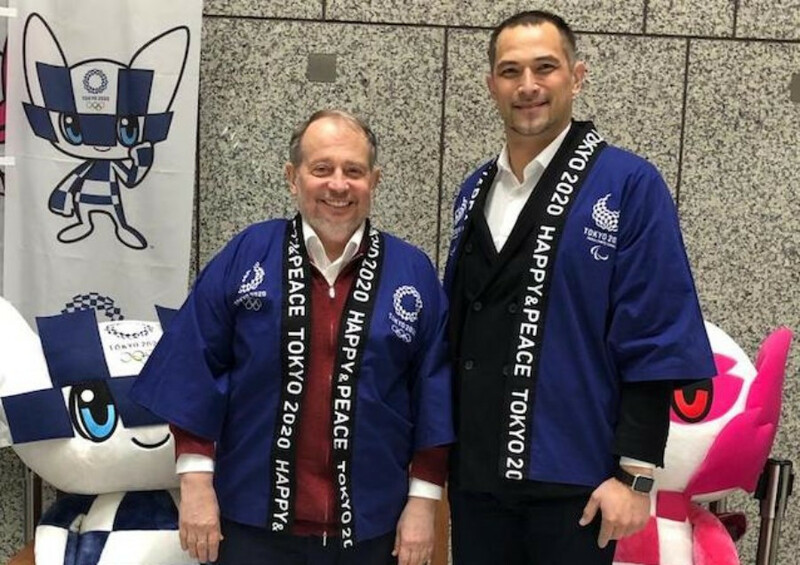 The governing body announced the proposals were discussed with Tokyo 2020 as ISSF President Vladimir Lisin made an official visit to the Japanese capital city to check preparations for the Olympic Games. The Russian was making the visit for the first time in the role, having been elected as ISSF President back in November. Proposals to help reduce the cost of construction of shooting facilities and the test event for the Games were suggested, the ISSF revealed. A test event for shooting is currently expected to take place in April, although this is yet to be officially confirmed by Tokyo 2020. The event will take place at the Asaka Shooting Range. The ISSF assert the proposals were part of the ongoing efforts to help reduce the costs of Tokyo 2020, a constant topic in the build-up to the Games. A delegation from the governing body met with Tokyo 2020’s sport department, including its director Koji Murofushi, where transportation, venue management and accommodation were reportedly among the key topics of discussion. Procurement and sport presentation were also areas explored during the meeting. The ISSF claim their delegation highlighted best practice methods to help with the planning of the sport at the Games and agreed to work jointly with organizers to achieve the desired result. An increased collaboration between Olympic Games organizers and International Federations has been heavily encouraged by the International Olympic Committee. It has been hoped the shared expertise would help to reduce the cost of staging the Olympic Games. Lisin also held meetings with the Kiichiro Matsumaru, President of the National Rifle Association of Japan, as well as Japan Clay Target Shooting Association head Yoshihiro Takahashi. 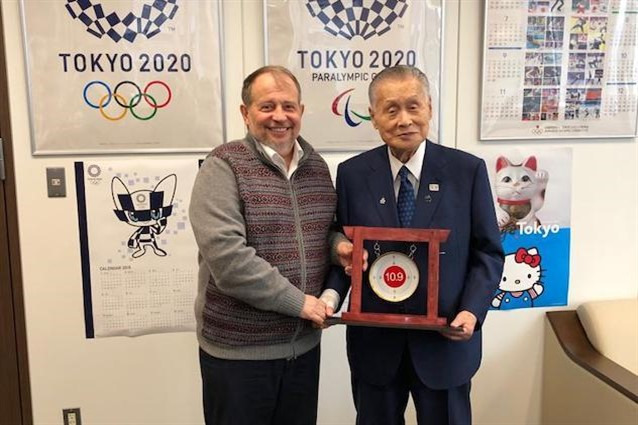 The ISSF claimed they had enjoyed a positive outcome from their visit, which was reportedly confirmed by a meeting with Tokyo 2020 President Yoshirō Mori. Unfazed by his opponents reputation, India's young shooting superstar Saurabh Chaudhary is confident that his strong preparations will help him to build on his stellar performance of 2018 and is hopeful of producing favorable results in upcoming ISSF World Cup Rifle/Pistol which is scheduled to take place in the capital city from February 20 to 28th at Karni Singh shooting range. "My training is going very good and I am happy about it. I am hopeful of producing good performances this time too. It doesn't matter to me who my opponent is, whether it's an experienced campaigner or a newcomer. I just believe in my preparations and it is the only factor that matters to me." "I don't prepare according to the tournament standards because there is stiff competition in each one, so my focus always remains in delivering my best." On being asked if there's any sort of pressure over him after his stellar performance of the previous year and all eyes focused on him, the young achiever said, he feels good about his yesteryear performance but isn't worried about pressure situation at all. "It feels good to deliver strong performance on the range and bring laurels for the country. And since my preparations are going very well so there isn't any pressure sort of situation." Talking about ups and downs in sport he said that it is part of the game and it is not always necessary that every time the results are favorable. "Ups and Downs are part and parcel of sport. It is not like that every time I will be the only one winning Gold. Winning obviously is a nice thing but winning every time is not fixed, so it goes on in sports." With 16 Tokyo Olympics quota places up for grabs in the tournament starting from 20th, India is still able to extract a maximum of 14 considering that Anjum Moudgil and Apurvi Chandela have already booked their quotas in the women's 10m Air Rifle and NRAI chief Raninder expects a healthy outcome from the 34-member home squad. "Realistically, I expect anything between two to four quotas. But in shooting, it is all about how you do on that particular day. So, we can get more also," NRAI chief Singh added. Site por Thom Erik Syrdahl. Tema Simples. Imagens de tema por luoman. Tecnologia do Blogger.